Glaciers at the edge of Greenland which are not connected to its huge ice sheet, or can be clearly separated from it, are contributing to sea-level rise much more than previously thought. Scientists from the University of Zurich together with colleagues from Denmark have found that, though these peripheral glaciers make up just 5-7 % of total ice coverage on the land mass, they account for up to 20% of the rise in sea level created by the region's melting. The scientists looked at glaciers which behave independently from the ice sheet, despite having some physical connection to it, and those which are not connected at all. The discovery, just published in Geophysical Research Letters, is important as it will help scientists improve the predictions of the future contribution of Greenland's ice to sea-level rise. Using lasers which measure the height of the ice from space, and a recently completed inventory of Greenland's glaciers and ice caps, scientists from the European-funded ice2sea programme, were able to determine changes in the mass of those ice bodies, separate from the main ice sheet. It also showed that the contribution to sea-level rise from the glaciers of Greenland separated from the ice sheet makes up around 10% of the estimated contribution of the entire world's glaciers and ice caps, and that contribution is higher than expected. 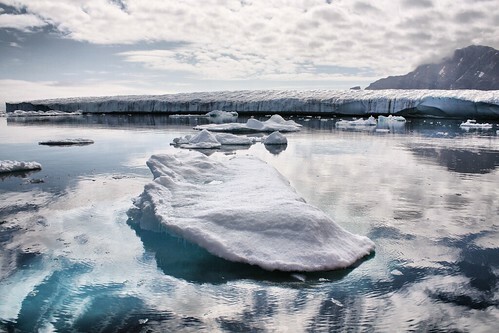 Lead author Dr. Tobias Bolch, from the University of Zurich, says, "The melting of ice on Greenland is known to be one of the major sources for global sea-level rise. Beside the large ice sheet, there are thousands of peripheral glaciers which are not connected to the ice sheet or can be separated from it due to the existence of ice divides. The area of those glaciers is about 50 times higher than the ice cover of the European Alps. Consequently, it is important to investigate not only the ice sheet but also these local glaciers." The paper, "Mass loss of Greenland's glaciers and ice caps 2003 -- 2008 revealed from ICESat laser altimetry data," showed glaciers with no or weak connection to the main ice sheet contributed to around 30 Gigatons (Gt) of water per year to sea level between 2003 and 2008. When they added in glaciers which had some link to the ice sheet, but which were still distinct from it in the way they flowed, this figure increased to up to around 50 Gt per year. This yearly figure represents more than half the water contained in one of Europe's largest lakes, Lake Geneva. The study gives more detail to the make-up and stability of Greenland's glaciers showing that mass loss is highest in the warmer south east of the land mass and lowest in the colder north. It also shows that the loss of ice is about 2.5 times higher for those separate glaciers than for the ice sheet, leading to the 15-20% figure. Dr. Bolch says, "The other 80-85% comes from the ice sheet. The new figure for the local glaciers is higher than expected. It matters because the ice loss with respect to the area is significantly higher than of the ice sheet. This means that the local glaciers react faster with respect to climate change. This information will help to improve the predictions of the future contribution of Greenland's ice to sea-level rise."